One of the fun aspects of my job is to enlist the creative side of my personality. Which you may think, happens quite often, but truly dreaming up a creative idea, busting out the paper cutter and scrapbook adhesive and actually crafting the idea into reality is genuinely fun for me. It’s like recess!! Are you sitting on the edge of your seats wondering what great project I may have to share? So here’s a few helpful ideas to give your event an extra spark without the busting the budget. 1. Think about those gorgeous wedding day shoes with the amazing bling you’re just dieing to have, but not quite so excited about splurging the $150-200 for them. As a creative alternative, buy a basic pair of silk evening shoes and attach your own bling. For the beautiful Nine West shoes shown, they were steal at under $60. The brooches were attached to a pair of clearance shoes at DSW for under $20. I simply cut the brooches off and hot glued them to the evening shoes. Solution that cost well under $100. 2. 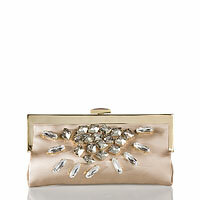 For a nice accent to those gorgeous shoes, how about an evening bag to match? If you’re like me, you love a couture hand bag from Devi Kroell, but may would love a more affordable option. For this, I would suggest shopping the clearance area or make a stop at Sam Moon (online, Dallas and The Woodlands store options). We were lucky to have found a perfectly matching green hand bag. However, weren’t as excited by it’s simple style. With a little help from our Bedazzler gun and sparkling crystals from Michael’s, our purse was just as fabulous as the shoes. All for under $40. 3.Your invitation will be the first glimpse your guest have as to what to expect at your event. If you’re like me, it seems nothing less than a custom masterpiece will do! With custom invitation prices ranging from $7-35/set, this can become a costly investment depending on your guest count. A few options to give your invitation some customization would be to purchase catalog invitation from a trusted stationer and attached it to a pocketfold. Papers and More has a wide range of color options and sizes. If you’re local to Houston, try Texas Art Supply where they give a bulk discount. The best type of adhesive to use would be Tombow’s pink cartridge scrapbook glue found at most Michael’s or scrapbook stores. For a chic option use your bedazzle gun to add a pop of crystal between your names or strategically placed in the design or monogram on the invitation. For a dainty look, you may opt to add a ribbon or bow to your invitation for a little accent. Ebay is an amazing resource for bulk ribbon well under $20. To present a very creative, option would be to place your 5X7 invitation in a box fastened with double satin ribbon, artistically wrapped in tissue paper. It’s almost like a personalized gift to each guest. Think of their excitement when they receive your invitation? !